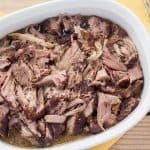 This pulled pork is perfectly seasoned with Chinese five spice - a mix of star anise, cinnamon, cloves, and fennel seeds. Season pork with salt and Chinese five spice. Using sauté setting – once hot, add oil and sear roast on all sides (2-3 minutes on each side). Remove roast and set aside. Add aromatics to pot (cinnamon stick, star anise, cloves, and fennel seeds) and toast for about 1 minute. Add apple cider to pot, along with trivet. Return roast to pot, placing on top of trivet. Lock lid and cook for 90 minutes at high pressure. Once cook time is complete, allow pressure to release naturally (will take about 15 minutes). Transfer pork roast to a serving dish and pull apart into bite-size pieces using two forks. Remove most of the fat. We prefer to eat this without sauce, though we do add some of the jus from the bottom of the pot. If adding BBQ sauce, I recommend a mustard-based sauce with this recipe.